Ferraris – a 275 GTB/4, a 250 GT California Spider and a 250 GT Berlinetta Speciale – are headlining the Gooding Pebble Beach classic car auction in 2015. Gooding & Co expects more than 40 cars to achieve results in excess of a million dollar each including 12 Ferraris and a remarkable 8 Porsches, including four racing cars from the official works team. Gooding & Co is the official auctioneer of the prestigious Pebble Beach Concours d’Elegance® and will hold its annual classic car sale at the Pebble Beach Equestrian Center on August 15 and 16, 2015. Ferraris are as usual expected to achieve the highest results at the annual Gooding Pebble Beach auction. Three are expected to sell for more than $10 million each. A 1967 Ferrari 275 GTB/4 is the only Ferrari on offer by Gooding without a pre-auction estimate. The car was recently rediscovered after being in storage for four decades. It is a highly original vehicle with even the paintwork considered largely to be the factory original. The car is unrestored but well maintained. The 275 GTB/4 was the last of Ferrari’s truly duo-purpose vehicles able to race on the track on weekends and doing duty as fast transportation during the week. The 1961 Ferrari 250 GT SWB California Spider with coachwork by Scaglietti (estimate $16 -$18 million) has by the highest published pre-auction estimate of any car on offer during the 2015 Monterey classic car week. It is one of only 37 covered-headlight examples ever built and amongst the most sought after classic cars in existence. The car has not been fully restored or (yet) shown at top events. The 1962 Ferrari 250 GT SWB Berlinetta Speciale with coachwork by Bertone (estimate $14 – $16 million) has the second highest published estimate of any car on offer this year during the Monterey classic car auction week in mid-August. This special one-of-a-kind Ferrari was designed by a young Giorgetto Giugiaro and built by Nuccio Bertone for his personal use and as an attempt to impress Enzo Ferrari. The car has a much more luxurious interior than standard Ferrari’s but is more famous for its fabulous shark-nose exterior inspired by legendary Ferrari racing cars. The 1957 Ferrari 410 Superamerica Series II Coupe with coachwork by Pinin Farina (estimate $5 – $6 million) was originally driven by Princess Soraya of Iran, who kept the car after her divorce from the shah. It is one of only six short-chassis Series II 410 Superamericas built and the 21st of the 34 total 410 Superamericas ever made. The car is in a beautifully restored condition. The 1965 Ferrari 500 Superfast with coachwork by Pinin Farina (estimate $3 – $3.4 million) also has royal provenance, as it was originally owned by Prince Sadruddin Aga Khan. This car was one of the last ultra-exclusive coach built Ferraris and one of only 28 left-hand-drive 500 Superfasts ever made. The car is in platinum-winning restored condition with over a million dollar spent on the car in the past 15 years. Gooding will have a large number of Porsches on offer at the 2015 Pebble Beach classic car auction. A remarkable 8 cars have estimates of over a million with two racing cars offering the possibility of setting a new marque record for the most-expensive Porsche ever sold at public auction. Four of these racing Porsches were originally Porsche Works cars. 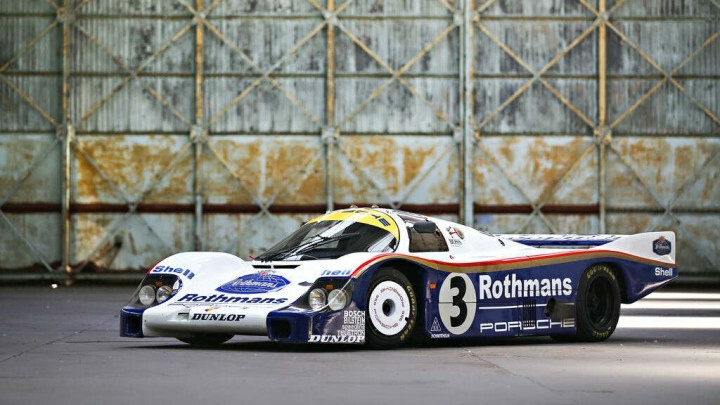 The 1982 Porsche 956 (estimate $7 – $9 million) was the overall winner of the 1983 24 Hours of Le Mans. The car was the third of only ten Works Porsche 956s built (with a further 12 going to customers) and had a remarkably successful racing history being driven by the top drivers of the early 1980s including amongst others Jacky Ickx, Jochen Mass and Derek Bell. A second place overall at Le Mans in 1982 was bettered a year later when the Porsche 956 won the 1983 24 Hours of Le Mans outright when driven by Al Holbert, Hurley Haywood and Vern Schuppen. This victory topped off a winning year following first places overall in 1982 at Spa, Fuji, Brands Hatch and Kayalami. The Porsche 956 is in its Le Mans longtail bodywork with Rothmans livery, as it appeared in its victorious 1983 race. It has the potential to set a new marque record for highest price paid for a Porsche at public auction. The 1960 Porsche RS60 (estimate $5.5 – $7 million) was the last of only four Works Porsche RS60s built. The RS60 had remarkable speed and performance but was let down by reliability issues. The car on offer was driven by amongst others Stirling Moss and Graham Hill. It is the only of the four works RS60 cars not in major Porsche collections. The 1964 Porsche 904 Carrera GTS (estimate $2.25 – $2.75 million) is one of nine 904s used as Porsche factory entries. The car finished second overall at Targa Florio (1964) and impressively second overall too at the 1965 Rallye Monte Carlo. Remarkably, the 904 was again raced 27 times at historic races during the 21st century. The 1967 Porsche 906 E (estimate $1.6 – $2 million) was a works entry for the 1967 12 hours of Sebring where it finished 7th overall and 4th in class. It is currently in the original Sebring livery. These Porsche 911 Carrera RS cars are increasingly achieving results in excess of or near a million dollars encouraging more owners to try the market. Although only 200 RS M471 Lightweights were built, many may consider the cars too similar to more standard 911s to warrant such premiums. Similar cars are on offer from RM Sotheby’s and Bonhams. The ultimate supercar of the mid-1980s – the Porsche 959 – was never officially offered in the USA. However, with these cars now reaching 25 years, many may be imported and driven with fewer restrictions. At recent auctions, several achieved results over a million dollar encouraging more owners to try the market. Bonhams and RM Sotheby’s also have a 959 on offer but this 1988 Porsche 959 Komfort has the highest pre-auction estimate of $1.6 – $1.8 million. This is a one-of-a-kind car built by Porsche Exclusive and has been in single ownership for the past 25 years.